With Cinema 4K and 5-axis stabilization, it's putting Sony and Panasonic on notice. Fujifilm has put Sony and Panasonic on notice with the X-H1, its new flagship APS-C mirrorless that excels at both photography and video. It sports a 24.3-megapixel X-Trans CMOS III sensor housed in a body with features from the ergonomically excellent X-T2 and medium-format GFX 50S. Fujifilm calls it "the highest performance camera in the X series lineup," thanks to features like true DCI 4K video (4,096 x 2,160), 14 fps max burst shooting and, for the first time in a Fujifilm camera, 5-axis in-body stabilization. The X-H1 has a dust- and water-resistant body that is meatier than others in the X-series with a big grip requested by professional shooters. From some angles, it looks much like the X-T2, with two dual-dials that let you control not just shutter speed and ISO but also shooting and focus modes. That's a big plus, as it helps you avoid diving into menus. But instead of the X-T2's exposure compensation dial (which you can access elsewhere) it sports a top LCD that shows information like shutter speed, f-stop, ISO and shooting modes at a glance -- just like the GFX 50S. Another key feature is in-body, 5-axis stabilization, the first in an X Series model. The X-1H has three axial gyros and a dual-processor that can do 10,000 calculations per second, giving you up to to 5.5 stops of shake reduction, depending on the lens. 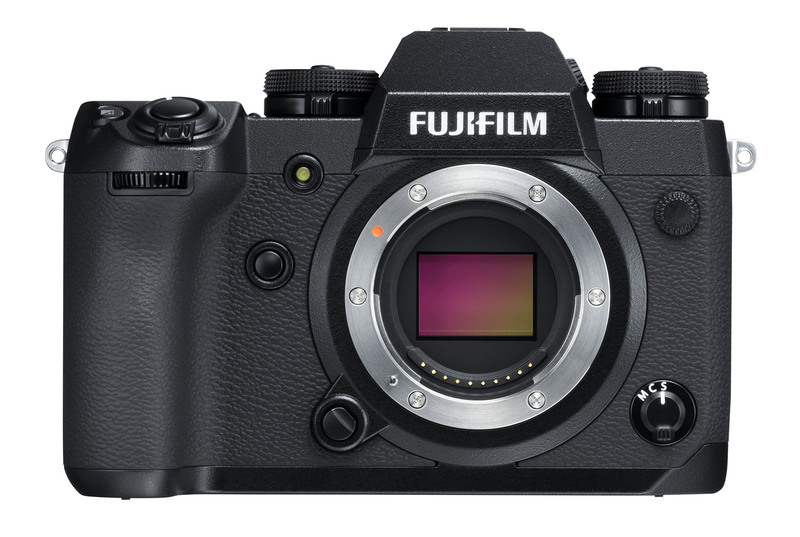 To further reduce vibration, it has a new leaf-spring shutter-release switch and electronic shutter that Fujifilm calls "near-silent." 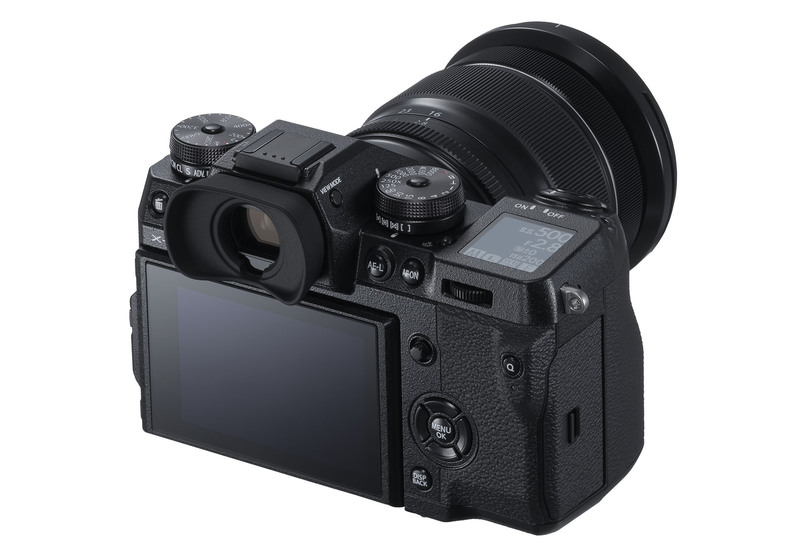 The X-H1 packs an all-new OLED EVF with 0.75x magnification and 3.69 million dot resolution, "leading the class for APS-C mirrorless cameras," Fujifilm said. It has display lag of 0.005 seconds and refreshes at 100 fps -- specs that jibe closely with the EVF on Sony's A7R III, you might notice. The 3-inch display has a 1.04 million dot touch panel that can be tilted in three directions, but can't be flipped around for vloggers or selfie shooters. The sub-LCD on top is 1.28 inches wide. With the X-H1, Fujifilm is finally making a serious bid to attract videographers. As with the X-T2, the sensor is cropped slightly (1.17x) and then super-sampled, yielding sharper video than you'd get with a 1:1 pixel readout. You can shoot 4,096 x 2,160 DCI, 24fps video and 3,840 x 2,160 at 30p, with a maximum bit rate of 200 Mbps. That's double that of the X-T2, but the GH5 and GH5s can handle 4K at up to 60 fps, with a 400 Mbps maximum bit rate. It also records 8-bit rather than 10-bit video like Panasonic's flagships, so you'll have a less rich color palette to work with. Fujifilm also added a 1080p, 120fps mode, F-log SD card recording to smooth workflow, a 12-stop dynamic range setting and a new "high-sound quality internal microphone" -- a plus, since the internal mic on the X-T2 is ... not good. Lastly, it's offering "Eterna," a film simulation mode "that is ideal for shooting movies." If you're wondering if the X-H1 has both microphone and headphone inputs, the answer seems to be "sort of." Like the X-T2, there is a microphone input, but if you want a headphone jack, you'll have to pay an extra $300 to get the "Vertical Power Booster Grip Kit." As a plus, you do get faster burst shooting speeds and continuous 4K video shooting is boosted from 15 to 30 minutes. Other key features include a new "flicker reduction mode," that eliminates strobing and banding under fluorescent and mercury lighting, 802.11b/g/n WiFi and Bluetooth 4.0 (no sign of NFC, though). Fujifilm also unveiled a pair of cinema zoom lenses that match up with the X-H1's new video talents, the Fujinon MKX18-55mm T2.9 and MKX50-135mm T2.9 (T2.9 means F/2.9). Those will run (wait for it) $4,000 and $4,300, respectively. Yes, cinema lenses are always expensive. Luckily, the X-H1 camera itself is a lot more reasonable, less than notable video-specialist mirrorless cameras like the Panasonic GH5, GH5s and Sony A7S II. It will arrive in the US on March 1st for $1,900, or $2,200 with the Vertical Power Booster Grip Kit.